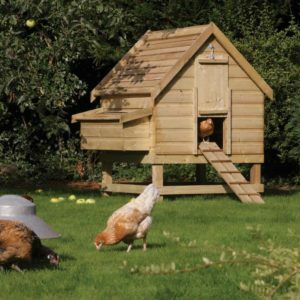 These chicken coops are made in the UK from pressure treated, FSC certified timber. They are delivered flat packed with instructions for self assembly. Both coops come with internal perches, nest box with removable lid for easy egg collection, a slide opening door with hook support, a ramp, and a rear door for simple access. Also a slide out floor for easy cleaning. Comfortably houses 6 chickens, with a 3 compartment nesting box. Dimensions: 1.58m h x 1540mm w x 1230mm d. Price shown includes delivery.